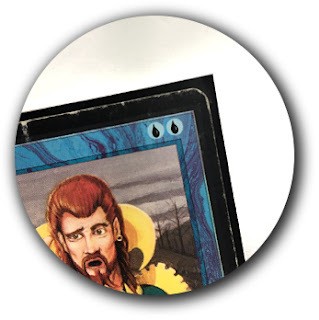 When I posed the question, "Are your sleeves damaging your cards?" 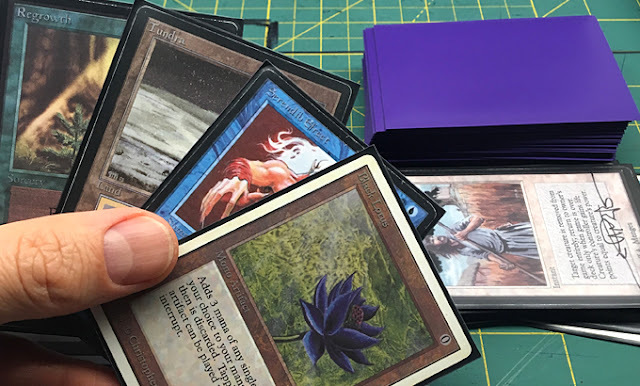 back in December, I got some great responses from readers and people have asked me what kind of sleeves I use for my cards. I want to talk about the ones I decided on and the reasons behind my choice. Getting back into the game earlier last year was my very first introduction to playing with sleeves. That's right, my first. The last time I played twenty plus years ago, they didn't exist. Every now and then we'd wipe down the edges of our cards when they started to look dirty, but that was the extent of it. We didn't know any different back then. Knowing what I know now, using sleeves is a no-brainer. That doesn't mean I like it though. There's just something about holding onto the actual cards that I will always love. Maybe it's because that's how I started out. Either way, sleeves are here to stay and using them makes sense. When it came time to buy sleeves, I had no idea where to begin. I felt like a complete noob. I'm sure it's a simple thing for players today, but it was an undertaking for me. I started out by asking other players what they used. Trouble was, for every person I asked, I got a different answer. There are only so many brands out there, but no brand rose to the top over the rest in my asking around. So I did what made sense to me... I bought a few of the brands everyone suggested and tried them out on my own. After a couple weeks of playing games and "goldfishing" in between (just trying to get a feel for playing with sleeves), I finally found a brand I liked and met my criteria. Ultra Pro PRO-MATTE Eclipse sleeves. 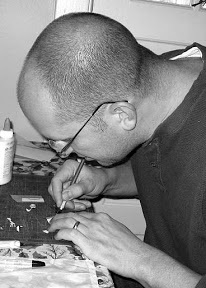 While it's not something most folks think about, it's something I'm acutely aware of from my art background and doing commission work. While the term can mean a number of things depending on who's writing the definition, the main thing you're looking for in this case are sleeves made of materials that are "acid free" and "contain no PVC" (Polyvinyl chloride). Basically I wanted to stay away from sleeves with chemicals that have the potential to damage my cards over time (however small that may be, I just don't want the headache). It took me all of about 30 seconds to realize I did not like glossy surface sleeves. They seemed to stick together when I shuffled and the gloss became a real problem for me when I played online. As an Old School player, most all of my gaming is done online. That's no surprise to most Old School gamers, it's just the reality of world we live in. Some of us are fortunate to have a local group we meet up with and play in real life, but I do not. Getting online to play was filled with another whole world of issues that I'll address later, but having glossy sleeves just created more problems than it was worth. Discovering that I could get matte surface sleeves was a windfall for me. I went from resigning myself to having to constantly deal with the glare on my sleeves to it being a non-issue overnight. Now I could see my cards without having to constantly bob and weave my head like an ostrich and more importantly, my online opponent could see them too. They've got a great overall feel as well. They aren't as bulky as some brands I tried and aren't as flimsy as others. If this were Goldilocks and the Three Bears, these feel "just right." The final results for this are still out as I want to put these through a bit more wear and tear before determining their long term durability. My first impressions are promising. No splitting along the long edges that I experienced with some other brands right out of the gate. I'll post again in a few months after running these through as many games as I can with a final report, but for now, no problems at all for me. There seems to be what I call a "break in" period where the sleeve sort of forms to the card inside of it. This doesn't take long at all and once this happens, the sleeves really seem to hold tight to the card from that point on. Knowing the problems that arise with even though slightest mention of "marked cards," I wanted to avoid this whole issue from the get go. Having a few altered cards and proxies in my deck that could be clearly picked out if my sleeves were the least bit see through was something I wanted to prevent from happening. Not that an online opponent is going to be able to tell, but I could tell and honestly, it ruins the game for me. There's a great deal of trust when playing someone online that both of you extend to the other. As someone who's been welcomed into the community with open arms, I don't want to cast any doubt on how I conduct myself when playing online. This last aspect might seem a little silly, but I still want to mention it. It's the black backing on the inside of the sleeves. No doubt it's there to ensure opaqueness, but it's a feature I really like. With other sleeves you see the color of the sleeve around the edges. I like having the black there. It's purely a personal preference, but I think the black makes the art on the card stand out and doesn't detract from it. I love my sleeves. Having gone from never used sleeves to finding a brand that I enjoy using was a big win for me. I've learned that choosing sleeves can be a real personal decision. Finding the right ones for you can make a huge difference in your gaming and how much you enjoy it. It's definitely made a difference for me. UPDATE: A huge thanks to all those who have commented on social media and emailed me with their experiences when it comes to UP sleeves. I'm building a list of what folks have reported happening to them to see how my experience compares and will put it all together in an upcoming post. Are your sleeves damaging your cards. Disclosure: This post has been sponsored by Ultra Pro. What exactly does that mean? I was not financially compensated for this post. I only work with those companies whose products I use myself. I received a sample for review purposes. This is my opinion based on my own personal experience with these sleeves. IMAGE: Some of my cards sleeved up in the sleeves I prefer.